. يقدم Casablanca Beachfront Apartments خدمات لا غبار عليها وكل أشكال اللياقة وحسن الضيافة اللازمة لإسعاد ضيوفه. يقدم الفندق واي فاي مجاني في جميع الغرف, تسجيل وصول/تسجيل خروج خاص, خدمة سيارات الأجرة, تسجيل وصول/خروج سريع, تخزين الأمتعة لضمان الراحة القصوى لضيوفه. بالإضافة لهذا,تتضمن كل غرف الضيوف مجموعة واسعة من وسائل الراحة . بعض الغرف توفر حتى تلفزيون بشاشة مسطحة, غرف لغير المدخنين, تدفئة, شرفة/ تراس, ساعة منبه لإرضاء أكثر الضيوف تطلباً. إن مسار جولف - ضمن 3 كم, حمام سباحة خارجي, ملعب تنس, حديقة هو المكان الأمثل في الفندق للاسترخاء وتفريغ طاقتك بعد نهار طويل. إن Casablanca Beachfront Apartments هو خيار ذكي بالنسبة للمسافرين إلى صن شاين كوست، بما يوفره من إقامة هادئة ومرحة. مكتب الإستقبال مفتوح من 08.30 AM إلى 04:30 PM خلال أيام الأسبوع و من 09.00 AM إلى 11.00 AM خلال عطلة نهاية الأسبوع. على الضيوف الذين سيصلون خارج هذا التوقيت أن يتواصلوا مباشرة مع العقار قبل وصولهم ليت ترتيب هذا الامر. The location of this property is red hot. The manager is the nicest man ever and therefore staying there was incredibly relaxed. Older style apartment, but that suited our visit. Pros: Located right next to Kings Beach. Very spacious apartment. Nice pool. The manager was very friendly and helpful. Aircon in living room and main bedroom. Foxtel. Undercover parking. Cons: Apartment is a bit old, a tap in the shower broke our first night, but was fixed first thing next morning. Lots of sand on the beachfront balcony, but that's to be expected. Great beach front location. Our 2 apartments (2 bedrooms and 3 bedrooms) worked well for our family group. Apartments are spacious and self contained, the pool and BBQ area are great for entertaining and having family time. The building doesn't have an elevator but the staff are more than happy to accommodate room placing especially if you have difficulty climbing stairs plus any other needs you may have, just call them directly. Close to the local shops and other facilities but best of all straight across the road from Kings beach! Parking underneath is very tight, ok for small to average cars but 4x4 and SUV's may have a tight fit. All in all though a very pleasant stay. Looking forward to our next visit here! I spent 9 nights in this accommodation which is located very close to the beach and not for from Caloundra centre. My 2 bedroom apartment was huge and is fully equipped. The only thing that was missing was a hair dryer and when I mentioned this to the manager he bought one for me that same day, so I really appreciated this super service. There is a small heated pool and the beach is only a few steps away. There is free wifi but the connection is not always stable, but that might be different for each unit subject to location of the unit. Even though it was not the most modern accommodation I had during this Australia trip I enjoyed staying here! Good pricing, spacious, clean, full kitchen, bathroom and laundry. Happy customer! 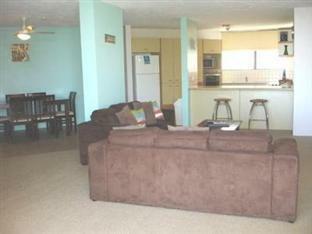 Cheapest we could find with a heated pool across from the beach, close to dining and many play grounds. We were pleased with our decision to stay here and will likely visit again. 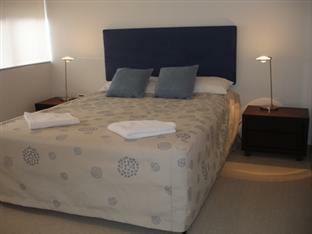 Comfortable and clean facilities, friendly staff and perfect location directly across from the beach. Pool and bbq area what more do you need. Stay was better than expected. Was travelling with a group of 5 and all were very impressed with the location and quality of accommodations. absolutely loved the stay. the receptionist was always more then happy to help, the room was perfect, so close to the cbd and the beach and take out places. couldn't have asked for a better week. Если бы не помощь проживающих, куковать нам у закрытого офиса мэнэджера пока рак на горе не свистнет. Этот парень укатил в Брисбен на скачки и на телефонные звонки просто не отвечал.